The Audi A8 is now the best-selling car in Canada. But only in May 2013. 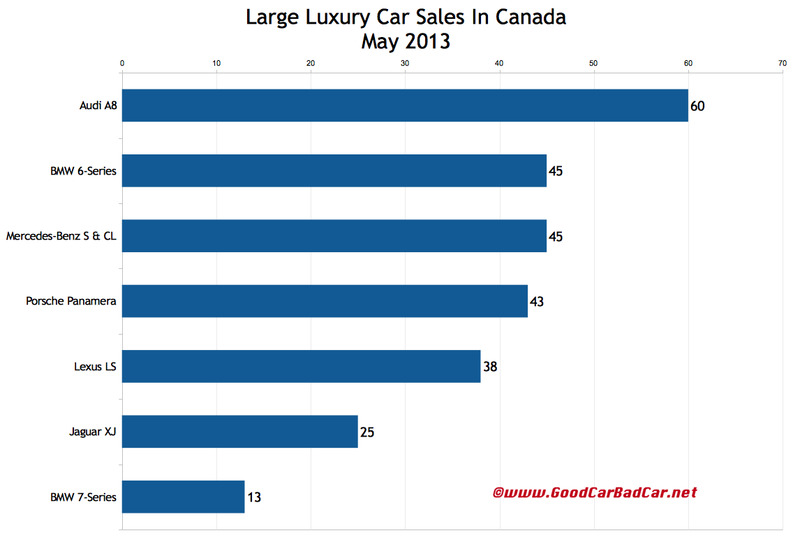 Year-to-date, the Mercedes-Benz S-Class, helped by its CL-Class offspring, is 53 units ahead of the Jaguar XJ. A 53-unit difference doesn’t sound like much, but put another way, sales of the Benz are 34% stronger than sales of the XJ. The XJ, meanwhile, is 25 units up on the Audi through five months. The A8 also trails the Porsche Panamera and the expanding BMW 6-Series range. Low-volume vehicle categories in a small market like Canada naturally feature vehicles with fluctuating sales totals. Audi only sold 11 A8s in March. The rise to 60 units in May comes as Audi clarifies its intent to be a major player in the category: there are now four engines available, including a diesel, and the A8 can ride on one of two different wheelbases. Its base price, $89,900, is $28,200 below the base price of the Mercedes-Benz S-Class. You can click any model name in the tables below to find historical monthly and yearly Canadian sales data. You can also select a make and model at GCBC’s Sales Stats page. This table is now sortable, so you can rank large luxury cars any which way you like. Suggestions on how GCBC should break down segments can be passed on through the Contact page. GCBC isn’t here to break down segments, an impossible task for any group, but to display sales data for the sake of comparison. The more ways sales data can be displayed, the better, right? This explains why you’ll see the BMW 6-Series here as well as with sporty cars… because readers have wanted it both ways. You can always find the sales results for EVERY vehicle and form your own competitive sets by using the All Vehicle Rankings posts. Sales data for brands such as Aston Martin, Ferrari, Lamborghini, Lotus, Rolls-Royce etc. are unfortunately not made available in Canada. Tesla doesn’t release a monthly Model S sales report, either. estimates for Ferrari and Lamborghini were 18 and 4, respectively. Total Maserati and Bentley volume is reported, but not by specific models.